(GREEK NEWS AGENDA) The 7th Annual Session of the World Public Forum “Dialogue of Civilizations” concluded on the Dodecanese island of Rhodes yesterday (October 13) with the adoption of the “2009 Rhodes Declaration.” The event was attended by 500 delegates from 70 countries and among the messages read out was one by Russian Foreign Minister Sergey Lavrov, who praised the positive impact of the annual forum on several international and regional mechanisms and in developing relations between civil societies in many countries. 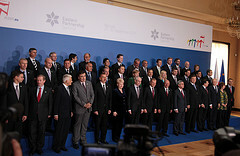 In its final meeting, the Forum decided to hold its 8th annual session on Rhodes once more, on October 7-10, 2010. (GREEK NEWS AGENDA) The two-day international conference on “Climate Change and Challenges for the Future Generations” – under the patronage of UNESCO – concluded yesterday, june 3, with the adoption of the “Athens Declaration on Vulnerable Children and Climate Change,” which places emphasis on the urgent need to limit climate change and assume action facilitating the necessary adjustments. 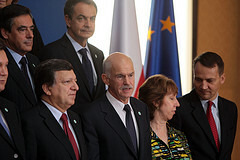 “Vulnerable communities in the Mediterranean region, such as the elderly and the very young, especially those suffering from chronic diseases, are most likely to be among those who will be greatly affected by the destabilisation of the climate system coupled with the imminent disruption of the eco-system,” the declaration underlines. According to the declaration, the Mediterranean region can play a key role in reducing greenhouse gases by increasing the use of renewable energy sources and promoting environmentally friendly technologies in important sectors of the economy.